As kids, most of us have a craft box full of everything and anything art related. Playdough, glitter (lots of glitter! ), milk bottle tops, straws, card – you name it, we had it. But the thing is, crafts isn’t just a fun activity for kids, it’s a hobby for us adults too! In fact making your own handmade items is a pretty huge trend right now, which began when the recession started and people looked to save money on everything and anything they could, they also looked at home for fun activities to do because budgets simply didn’t allow for as many nights out any more. It also became popular recently because we’re all so much more environmentally aware now, and many of us look to upcycle, recycle and make our own decorations, cards and gifts now because we know every little does help our wallets and the planet. So, if you’re one of the many millions of adults with a love of crafts, now is the time to embrace it and embrace your craft box! A banana box – these are free at the supermarket (just ask at the customer services desk) and made out of strong cardboard so will be strong enough to hold your craft stuff, but easy to dispose of if it gets wet or you upgrade to something sturdier. Make sure you cover the bottom with a layer of strong card (they tend to have holes in the bottom). A wooden vegetable palette – these types of boxes can be harder to come by, and you might have to pay up to £10 to get one, but they look great. Old fruit boxes are very trendy right now which is why they cost more, but they look very pretty and you can repaint them if you want to put your own creative stamp on how they look. A plastic container – if you’re the practical type, a plastic container is ideal for you. They are easily wiped clean and strong too. A foldable material box – these are available from many stores and a well known Swedish furniture company. They come in plain designs or patterned designs and are sturdier than they look. An old suitcase – if you want to be really vintage and quirky, an old zip up suitcase could be a very cool way to store your crafts. What Do I Put In My Craft Box? Standard Supplies – you’ll want all the basics like paper, card, pens, pencils and scissors in your box to make sure you have the basic ingredients for making cool stuff. Sticky Stuff – in a kids box you tend to have PVA and sticks of glue as standard, whereas adult craft supplies get a little bit more extensive. Opt for a general glue like a PVA as well as stronger adhesive for fiddly stuff like gems. Found Objects – there are plenty of pretty things around that will come in useful for craft projects. In kids boxes they might be egg boxes or plastic bottles, in adult boxes you’re looking for things like shells, buttons and beads, thick string and even old shirts for making t shirt yarn (yes really that’s a thing, look it up!). Inspiration – whilst you’re likely to find a lot of inspiration from social media sites, it’s likely you’ll still come across ideas in magazines, newspapers and even books. If you see something you want to make, rip it out and put it in a plastic ‘inspiration folder’ in your craft box. Then when you do get an afternoon spare, you can whip out your folder and get creative. Keep the box out of the reach of little hands! This is your box, and the materials inside are likely to be expensive so you don’t want the kids getting their hands on them. Plus, stanley blades, adult scissors and strong adhesives are not suitable for children. Ensure everything is put away right – you will want the box to be organised so you have easy access to everything when you do spend time crafting. Tie up paint brushes with elastic bands and put anything that might leak in a plastic food bag or freezer bag so it doesn’t spill all over the other items in your box. Newspaper, an apron and old sheets – you don’t want to have the time to make stuff and then find you have nothing to put down to do it on! Use It! 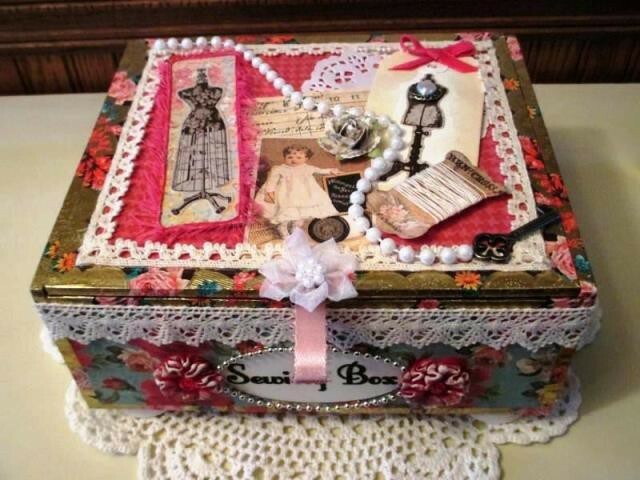 – don’t create the most beautiful craft box and then avoid using it because it’s so perfect! Crafts are there to be used, so use them and enjoy yourself!